This is the quote and poster that is pasted on the door of Dr. Grenestedt’s office as breaking world records is a enormous accomplishment for anyone to achieve. The enclosed streamlined motorcycle, or streamliner, that Joachim Grenestedt built looks like a miniature airplane with no wings. Its tiny cockpit seems far too small to fit a person of average size, much less Grenestedt—who stands 6 feet, 4 inches tall. Grenestedt built the streamliner to set a land speed record, but the contorted position he must assume inside the cockpit hardly permits him to drive, let alone race. He must lie almost flat on his back, and safety restraints are strapped so tightly against his body, arms, ankles, knees and thighs, that he can barely move his left foot to change gears. 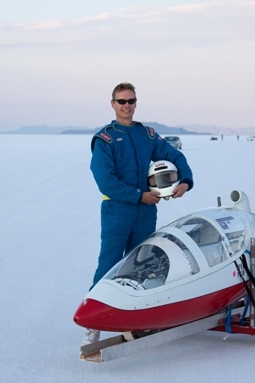 Dr. Grenestedt navigated his streamliner across the snow-white, marvelously even surface of the Bonneville Salt Flats in Utah at a speed of 133.165 miles per hour. 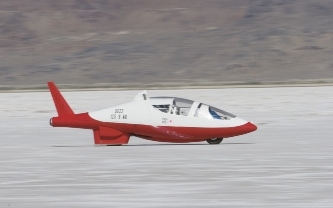 He shattered the previous U.S. land speed record of 125.594 mph for 125-cc engines running on gasoline. Here is some of Dr. Grenestedt’s Background according to the school website. – unmanned aircraft that can be launched from a cannon. Since joining Lehigh’s faculty in 2000 he has used composites in the development of innovative designs, from ship hulls to skis to record-breaking streamliners. As you can see, Dr. Grenestedt is a very accomplished individual. Even though he emphasizes a significant amount on research, he also teaches some very interesting courses like Fundamentals of Aircraft Design which is a course necessary for the Aerospace Minor. I personally have never had him but have heard many things about him and I cant wait until next year when I am a junior and I am able to learn from this man. Again, not everyone has the opportunity to learn from someone who breaks world records; so why not take this opportunity? This entry was posted in Uncategorized and tagged 125cc, Grenestedt, land speed record, Lehigh, Lehigh's Faculty, lightweight structure, speed, streamliners, World Record. Bookmark the permalink.